Which brochures would you like to receive? Send me occasional emails about things I'm interested in! As you read through our Travel Guide, you will come across articles and photographs describing the activities and natural beauty our region has to offer. 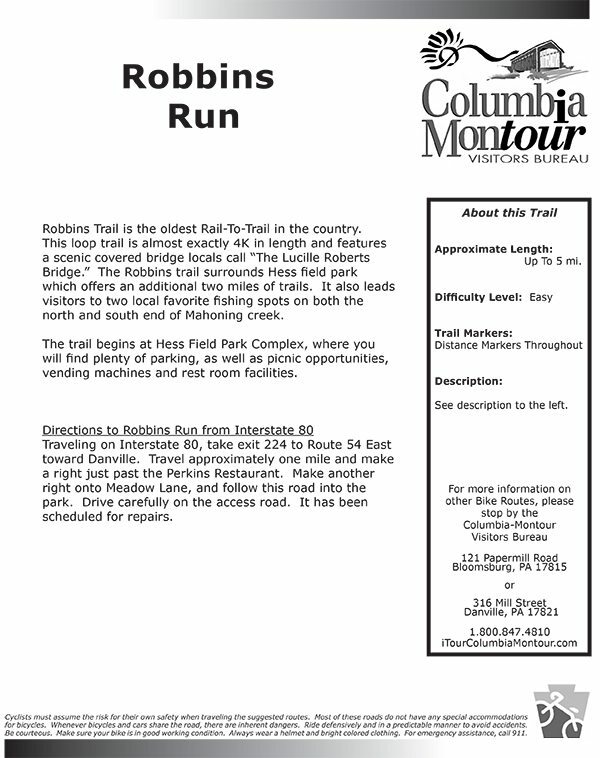 View listings of all of our members, as well as maps of the area – all helping to make your next trip to Columbia & Montour counties an enjoyable one! A driving map of all 25 Covered Bridges in Columbia and Montour counties. Spend the day meandering through the many covered bridges and rolling farmlands of the area. Take a historical and educational journey through covered bridges built on hard work, craftsmanship and determination. 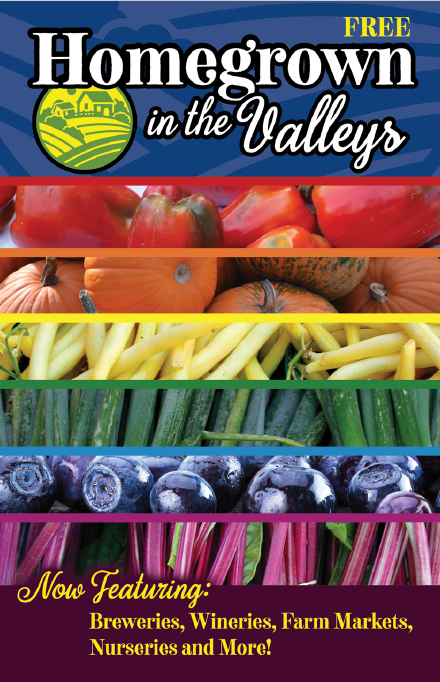 This full-color agritourism map is your resource for locating farm fresh foods, value-added products and agritourism experiences throughout the Valleys of the Susquehanna 5-county region. In this guide you’ll find opportunities to explore the beauty and bounty of the region, from farm stands and farmers markets to wineries and pick-your-own farms. Whether you’re on the hunt for a specific product or taking your time to explore the countryside, this guide will help you find what you are looking for! Sponsored by the Columbia Montour Visitors Bureau, the Festival is situated in the beautiful surroundings of Knoebels Amusement Resort. The Annual Covered Bridge and Arts Festival is held Thursday, Friday, Saturday and Sunday on the weekend following the Bloomsburg Fair. One of the most popular craft festivals in PA with 400+ crafters, park rides, demonstrators, pony rides, food, covered bridge bus tours and much more! Hit the trail, join the rats, and taste the brews! Amazing craft beer and excellent brew pub food is what you’ll find along the River Rat Brew Trail. Invite your friends and visit Central Pennsylvania’s first craft beer brew trail! This year, come to Columbia & Montour counties to enjoy a festive trip through the heart of the Central PA countryside. 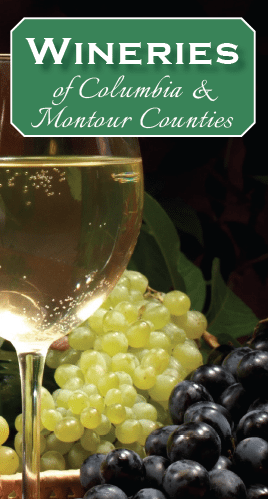 Along the way, stop at seven fantastic local wineries and enjoy exquisitely-crafted local wine. Throughout the year, the wineries will host specialty events with special seasonal pairings and chances to win wine-themed prize baskets. The annual Wine & Chocolate Week is set for February 8th-17th and this autumn, the second annual “Wine & Whoopie Pie” Trail is planned. Download our winery guide today and begin planning your wine-themed adventure! 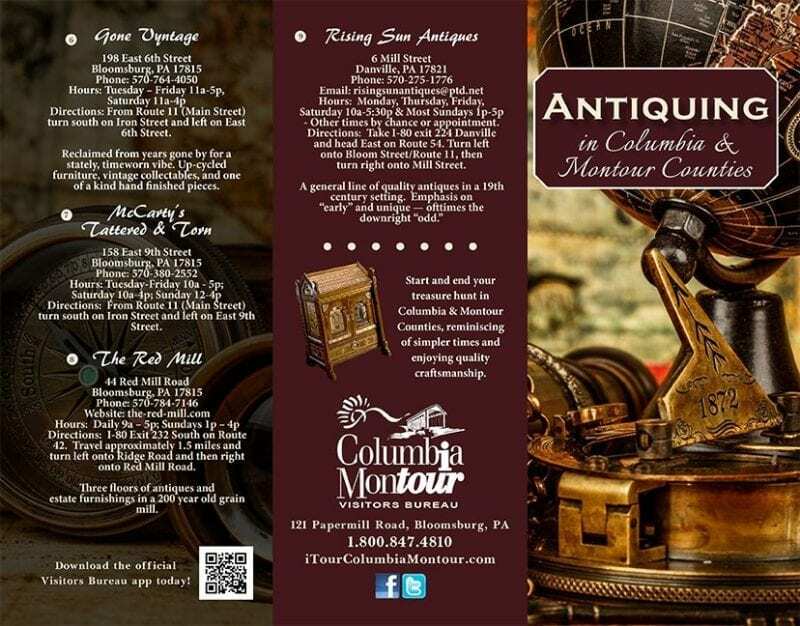 Create your own antique road trip in the scenic countryside of Columbia and Montour counties where you’ll discover why many East Coast dealers buy their antiques from PA antique dealers. 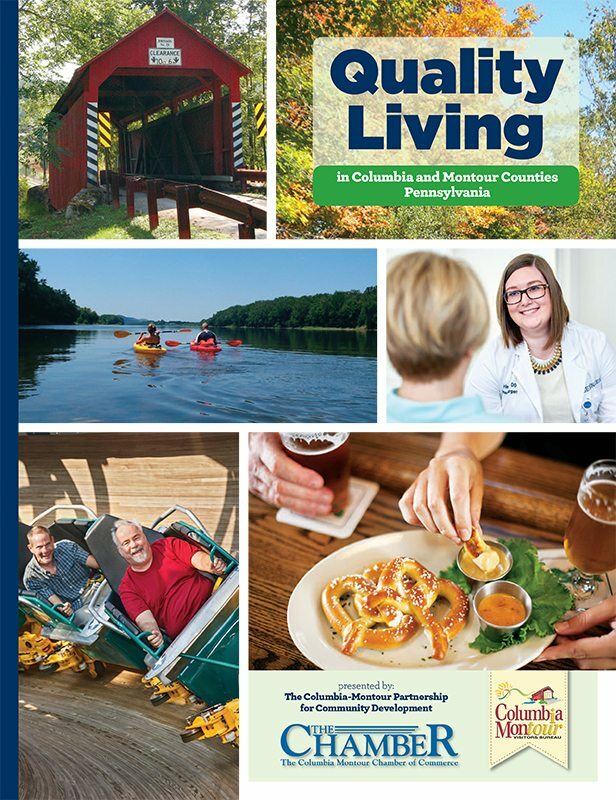 This publication is complete with high quality images and detailed information about Columbia and Montour counties. The 40-page guide showcases everything that makes the area a desirable place to live, work, visit, and enjoy. Sections include Healthcare, Education, Outdoor Recreation, Real Estate, Dining and Shopping, along with many others. Bloomsburg’s Historic District offers a wealth of visual delights to sharp-eyed observers. 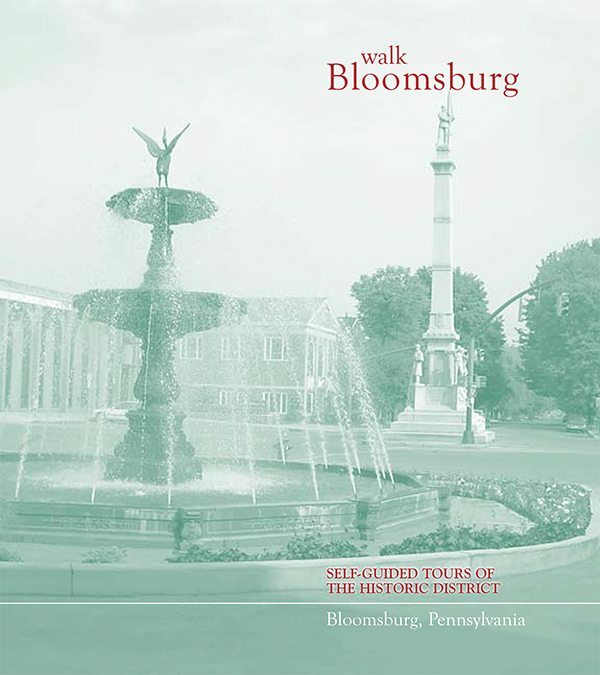 This booklet outlines two Self-Guided Walking Tours to highlight some of the outstanding features of Main Street and the adjacent residential areas. Friendly neighborhoods and quaint shops of Danville await your discovery as you stroll through the streets of our community. This is a self-guided walking tour of historic Downtown Danville and the surrounding historic districts. Berwick was originally founded in 1786 by Evan Owen, an English Quaker. He began to plot out and survey lots as early as 1780. Berwick’s Walking Tour is 1.5 miles of some of the most historic homes, buildings, and residences of several influential individuals who settled here throughout its more than 200-year history. The walking time is a little more than an hour. 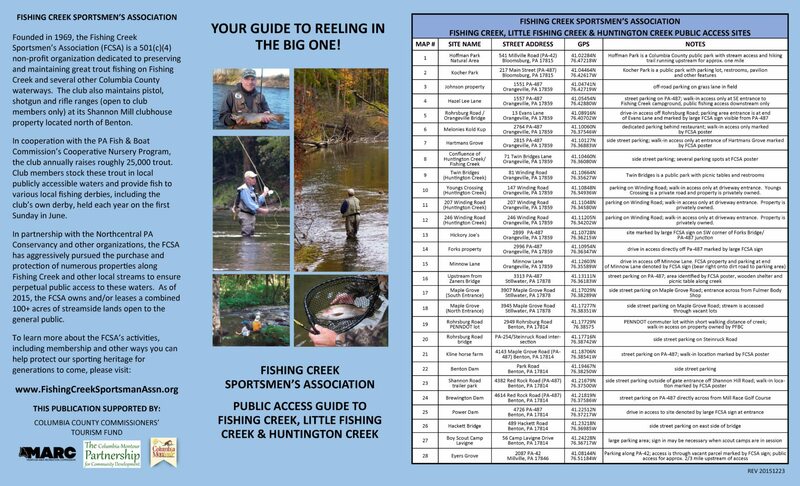 Map and public access guide for Fishing Creek, Little Fishing Creek & Huntington Creek. Your guide to reeling in the big one! 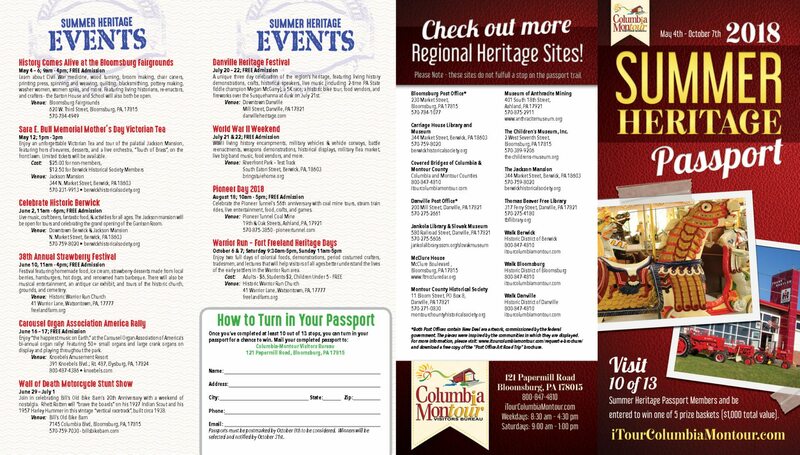 The first ever Summer Heritage Passport takes participants on a journey through the history, culture, and stories of Columbia & Montour Counties and beyond. The Passport begins on Friday, May 4th and lasts through Sunday, October 7th. At each of the thirteen stops, passport holders will receive a sticker. Once at least 10 of the 13 locations have been visited, and stickers received, individuals may mail their completed passport to the CMVB Welcome Center to be entered in a prize drawing. Spend a day, or weekend, exploring the tree lined streets, back country roads and hidden trails that Columbia and Montour Counties have to offer. This PDF contains turn-by-turn directions and maps for 16 different bike routes in our region. One of the many pleasures of visiting our region is walking around our traditional town centers. Each has its own assortment of commercial and residential buildings, but the one feature we all have in common is the post office, which was intended to be a “federal presence” in the heart of the community. 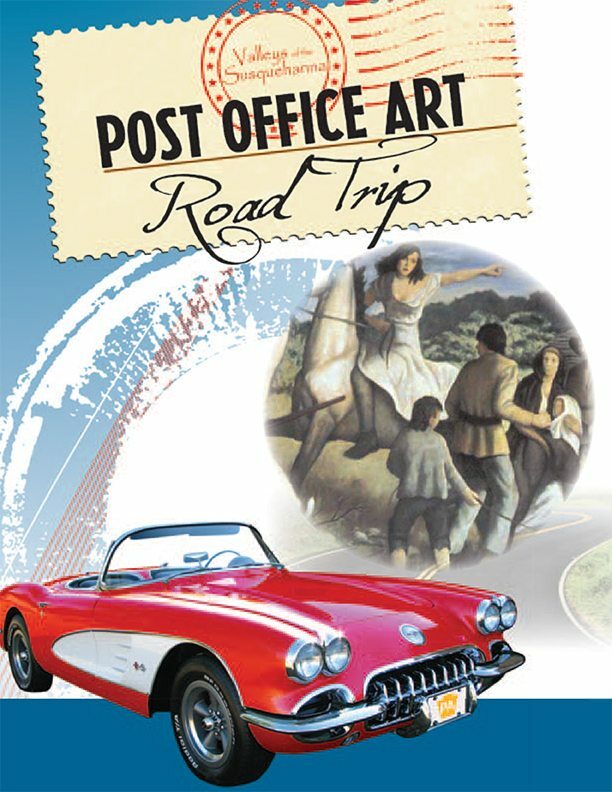 Venture inside the post offices and you may be surprised to find beautiful and significant works of art usually found in galleries and museums. Such works of art were created during the New Deal Era when the federal government commissioned artists to create murals and sculpture inspired by the community in which they were displayed.